Warrantless wiretapping, tracking the phone calls of millions of Americans, presidential signing statements signaling the president’s willingness to ignore the law, torture, secret prisons, kidnapping, and spying on peaceful political groups like the Thomas Merton Center and PETA weren’t enough to lead the Congress to realize that we are dealing with an executive branch that is abusing its power and that the legislative branch has an obligation to check this overreaching. But a nighttime search of a representative’s office has awakened Congress from it’s slumber/stupor. As Chairman of the House Judiciary Committee, Congressman Sensenbrenner can seek to compel administration officials to testify on these gross violations of privacy and fundamental freedoms. The recent search of one congressional office by federal law enforcement officials has made some members of Congress keenly aware of the White House’s extraordinary claims of executive power. We hope that this outrage and concern, which hits home for lawmakers, extends to the millions of Americans whose call information and conversations have been monitored by the National Security Agency without a court order. Congress must put an end to the administration’s stonewalling and investigate these gross abuses of power. Don’t get in the way of a PO’ed librarian. That was a lesson for us kids who made too much noise and, in turn, got the dirty looks and verbal wacks from the local library staff. But, in this case, we’re not referring to talking too much. This is about losing your freedom of speech. 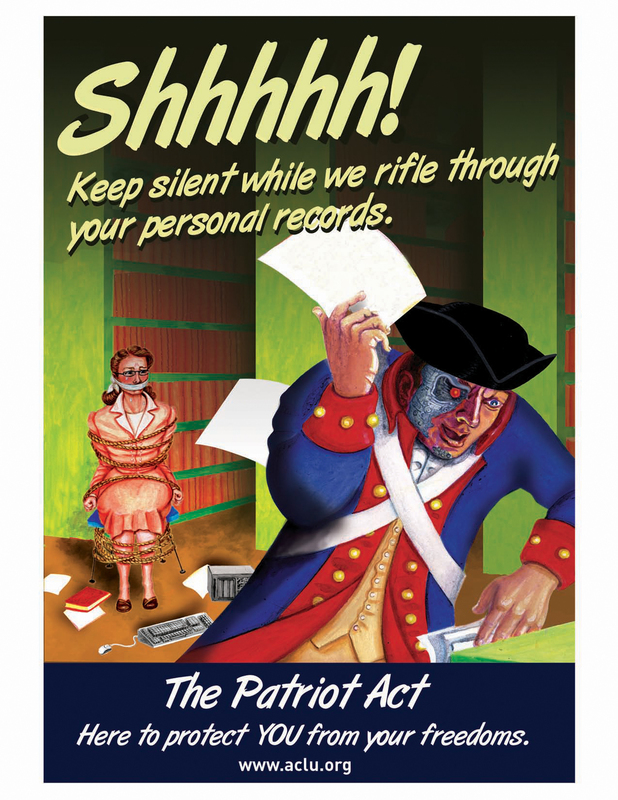 As pointed out last month here at SF, our librarian clients in a Connecticut case involving the Patriot Act were gagged by the government just as the Patriot renewal debate was at its height. In April, the government lifted the gag, and today our clients spoke out for the first time. Check out today’s press release from national ACLU. NEW YORK (AP) — Republican Mayor Michael Bloomberg thrust himself into the national immigration debate Wednesday, advocating a plan that would establish a DNA or fingerprint database to track and verify all legal U.S. workers. Bloomberg compared his proposed federal identification database to the Social Security card, insisting that such a system would not violate citizens’ privacy and was not a civil liberties issue. The mayor said DNA and fingerprint technology could be used to create a worker ID database that will “uniquely identify the person” applying for a job, ensuring that cards are not illegally transferred or forged. Great idea. There’s no way that database would be abused. No sirree. Today the ACLU of PA (along with 19 other ACLUs across the country) filed a complaint with the state Public Utility Commission on behalf of a group of individuals and organizations who are concerned about the privacy of their telephone records. The complaint asks the Commission to order the telephone companies to reveal what information they have disclosed to the NSA and asks the Commission to hold such releases in violation of Pennsylvania law and to prohibit future releases. Here’s more information about the case. Maybe I wouldn’t have been so naive if I had first read John Ashcroft’s FOIA memorandum, which was issued in October of 2001 and supersedes previous FOIA policies. OK, so it doesn’t prove a whole-hearted crackdown on the release of information by the government (and there are no black helicopters circling the sky). But it certainly suggests that Ashcroft deliberately tried to create a chilling effect on the release of FOIA material. Join us on Tuesday to Tell Specter to Investigate – Not Legislate! Our national office recently alerted us to the fact that Arlen Specter – you know, the one who walks around threatening the funding of the NSA unless more information comes out about illegal spying, who repeatedly asks “where’s the outrage?” about the secret spying – will be introducing a really, really bad bill on the NSA as soon as next Thursday. It would retroactively authorize the president and NSA’s actions, expand the executive branch’s powers and make judicial checks to protect innocent Americans optional. But we’re not taking this lying down. We’re organizing an emergency press conference/demonstration next Tuesday at 12:30pm outside the Federal Building in Philadelphia (where Specter’s Philly office is) on the 6th street side. Bob Barr, the former congressman, will be a featured speaker. It’s really important that we get as many people as possible to attend. We want to show Specter that the outrage is right HERE! A great crowd of about 50 concerned citizens came out last night to the Unitarian Church of Harrisburg for a screening of The ACLU Freedom Files: Gay & Lesbian Rights. We were also fortunate to be joined by community activist Kathleen Daugherty and Dan Miller of Harrisburg City Council. Big city folk can kick around little ol’ Harrisburg, if they wish, but how many PA towns would elect an openly gay man?. The crowd was clearly energized and concerned about where we are heading on the debate over g&l rights. Me, I’m an eternal optimist. A majority of Americans support civil unions, opposition to gay marriage continues to drop, and the younger generations are very accepting of homosexuality. But it’s easy for me to be an optimist because I don’t have to live with the discrimination and second-class citizenry every day. I can appreciate the anxiety of our LGBT amigos. We’ll keep pushing the ball forward, knowing that we’re on the right side of history. I have such mixed emotions about Senator Specter right now. Sometimes I almost let myself develop feelings for him, but then he just keeps doin’ me wrong. “I don’t need to be lectured by you. You are no more a protector of the Constitution than am I,” Judiciary Committee Chairman Arlen Specter, R-Pa., shouted after Sen. Russ Feingold (news, bio, voting record) declared his opposition to the amendment, his affinity for the Constitution and his intention to leave the meeting. The sad thing is that Specter’s right. Neither of these men (or the parties they represent) have exactly been Knights Templar for the Constitution. I thought that was kind of cute. But then, I’d had a few. Ever get that feeling that someone’s watching you? A prominent Republican on Capitol Hill has prepared legislation that would rewrite Internet privacy rules by requiring that logs of Americans’ online activities be stored, CNET News.com has learned. The proposal comes just weeks after Attorney General Alberto Gonzales said Internet service providers should retain records of user activities for a “reasonable amount of time,” a move that represented a dramatic shift in the Bush administration’s views on privacy.